Could it launch alongside the Note 9? We know Samsung is preparing to launch a new smartwatch, called the Galaxy Watch, and the latest leak suggests you may not have long to wait before it's officially unveiled. Why do we say officially? Well, because Samsung has already given us an unofficial glimpse thanks to a website error - listing the watch for a brief period of time last week. A new certification offers further proof we'll be seeing it soon - possibly alongside the Samsung Note 9 on the 9th of August. 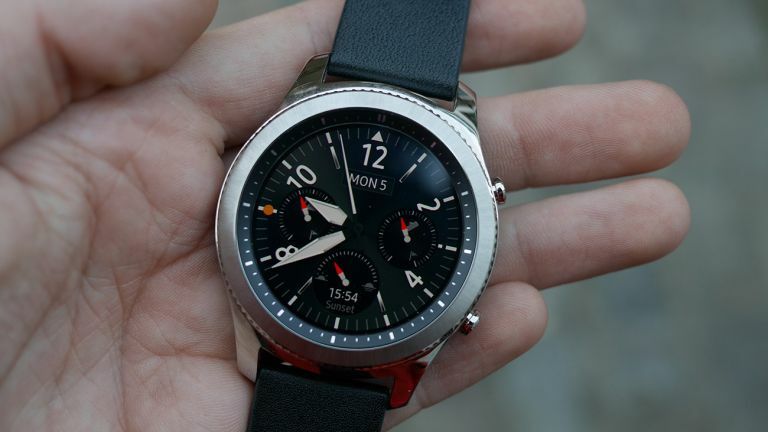 91 Mobiles spotted the Samsung Galaxy Watch has just received its radio certification in Korea - after previously getting its Federal Communications Commission (FCC) approval in the US earlier this month. The certification doesn't shed any light on the watch’s design or features, but it is further evidence that the watch release is imminent. Samsung has a number of events coming up to launch the watch, the most likely being the Samsung Galaxy Note 9 launch in New York next week on August 9. That's just eight days away! Samsung is also hosting a livestream for a new product today, but we think the Korean brand would want to make more noise about the relaunch and rebranding of it's smartwatch line. Of course, there's also IFA coming up at the end of August. Samsung could choose to launch it here, but may wish to avoid competition for coverage from other brands. Undoubtedly, the Samsung Galaxy Watch and Note 9 will be displayed at IFA.